We only sell hardwood BBQ pellets from mills that pack bags with 100% of the woods shown on the label. No Additives. No Binders. No Flavour Oils. No generic "hardwood" references. A good barbecue pellet will contain zero additives or binders - we don't just sell good BBQ pellets, we sell GREAT BBQ pellets! Avoid pellets that don't explicitly state the species of hardwood used; "hardwood" on its own just doesn't do it! ONLY use food-safe hardwood pellets. Heating are cheaper but may contain bitter softwoods and residues or materials dangerous to health. NEVER let hardwood pellets get wet. If exposed to excessive moisture they will expand, degrade, and set like concrete - damaging equipment. Different hardwoods impart different flavour notes to different foods... rubbed with different spices/herbs and mopped or served with different sauces! They also burn at different temperatures. If you're after pellets for cooking at higher temperatures, you might want to choose a blend containing oak. Cookshack's pellet blends are commercial grade and can be found in many of the UK's leading BBQ joints. GMG's blends are great value for everyday backyard cooking. Smoke Ring and Lumber Jack's give you no-nonsense 100% wood flavour, on their own or as part of a mix. 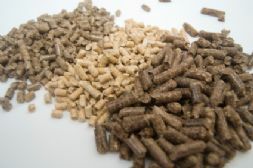 No Hidden Costs: All pellet prices shown on this site INCLUDE DELIVERY (to most UK Mainland addresses) and VAT. Green Mountain Grills' pellets are shipped in BOXES of 2x 28lb/12.7kg bags (i.e. 56lbs of pellets).